If you are interested in prints, electronic files, or usage rights, contact me at my website. For those interested, I have written several articles about macro photography. Photos Copyright ï¿½ M. Plonsky. All rights reserved. thanks alot for helping me to gain this insects images for my studants. To what order do beetles belong? I am a future Entomogist and ( even though I'm 12 years old) inspire me to one day get a better camera than what I have today. But for now, I'm stuck with my camera that I have now. Wonderful pictures! And nice angles. Why is the ''Leather winged Beetle on a daisy'' camofladge? 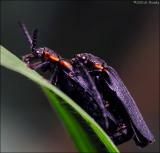 Where can you find most of these beetles? how many different species of beetles are there????? 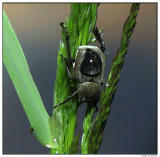 Has anyone ever heard of a web site where there may be 3d photos of Beetles? Stunning photo of the Locust Borer. 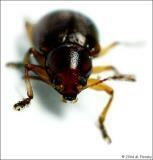 I am an avid Coleoptera fan, love your work. The rich palette nature has provided to the beetle families is well comlemented by your masterful photography. The provision of the scientific names of the beetles would be helpful to me. I just purchased a macro lens and I have been on the look out for some tips, techniques, and inspiration. Thanks. Your site has been a great tool and is very inspirational. You have things here that aren't beetles. Brown stink bugs, for example, are in Order Hemiptera, not Order Coleoptera. Great pics, though.